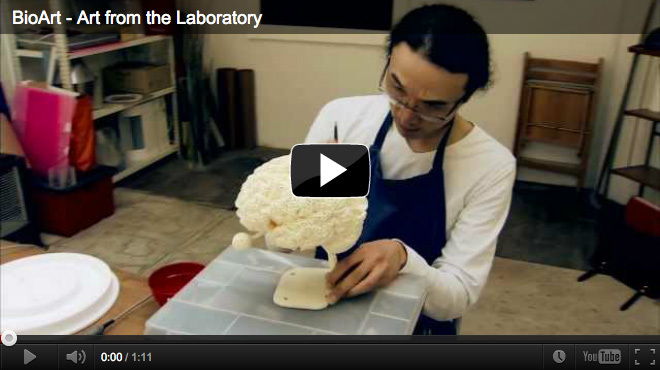 A co-production of styblo.tv, ORF and ARTE, 54` documentary about bioart, © 2011. "BioArt – Art from the Laboratory" is representing ORF at the 2012 Rose d'Or Competition in Lucerne, as well as at the 2012 International Emmy Awards Competition in New York City. German, French, English (voice-over), produced and directed by Robert W. K. Styblo. "BioArt – Art from the Laboratory"
is representing ORF at the 2012 Rose d'Or Competition in Lucerne, as well as at the 2012 International Emmy Awards Competition in New York City. The relationship between art and science has always been multifarious and today, in the age of technoscience, has become decidedly ambiguous. Between the mechanisation of living things in biological science and the "bringing to life" of machines within the exploration of artificial life, the protagonists of transgenic art and artificial life art have dared to adopt the methods and procedures of life sciences, creating new art forms in the process. "BioArt - Art from the Laboratory" is a documentary about the BioArt movement, its technical aspects, new visions and a new approach to mankind's great philosophical questions coupled with insights into the amazing work of progressive bio-artists.